After having finished Rage Bane of Demons, Thony Silas found work at Marvel, and couldn’t work on Rage anymore. 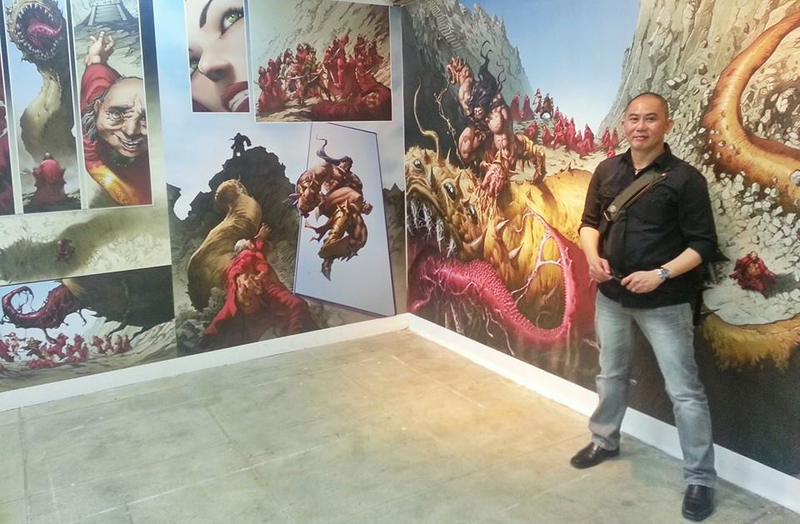 So for the first issue of the Rage Series, I chose Filipino Artist Alan Quah of Chiaroscuro Studios. You might have heard of Alan for his work on Legendary’s Godzilla, Dark Souls, The Vampire Diaries, the Evil Dead 2 Anthology, the Harvester, and Orphan Black, but at the time I began working with him, he was still mostly unknown, like Thony. So, I sent him a script for Rage #1, which began with a flashback filled with action, and continued with scenes from the past alternating with scenes from the present, mostly about characters arguing. I wanted to balance the action with the “talking heads”, to make it last longer, but Alan had more action scenes in mind, so he sent me his layouts for approbation, and they were so dynamic and well-thought that I adapted my script to it. The story now began with a long flashback scene, then cut into the present. It was less balanced, but the Art compensated for it… until Alan began to have contracts with established publishers (who pay better than me), and didn’t have time to work for me anymore. I waited almost two years for Alan to find some free time, before deciding to give the job to Stéphane Degardin, who penciled and colored the rest of the book. So Rage #1 begins with a Flashback scene penciled by Alan Quah and colored by Komikaki Studio, then cut to the present scenes penciled and colored by Stéphane Degardin. I’m not entirely satisfied with the result as a whole, but I still managed to make it a fine story and an excellent introduction to the Rage Series.